How to Become a Hospice Volunteer! Hospice Northwest is a volunteer non-profit organization, dedicated to providing compassionate support and resources to our clients and their loved ones… wherever they may need it. Our Hospice Volunteer Palliative Care Training Program is held annually (Deadline for this specific training program is February 22nd, 2019). Recruitment for new hospice volunteers is ongoing throughout the year. We will carefully review your application to ensure you are a good fit for our team. We will also require two personal references and a current criminal record check. Once your application has been reviewed, our Volunteer Coordinator will contact you and schedule an introductory interview. Your hospice volunteer training sessions will begin after you are accepted into the hospice volunteer program. 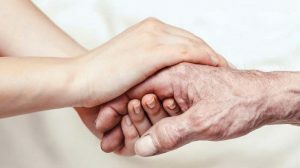 You will be enrolled in a provincially accredited hospice volunteer training program which will help you understand the many issues people face at the end of life. Not everyone who completes the training will go on to become a Hospice Northwest volunteer. However, once you have completed your hospice volunteer training, you will have a valuable life skill that you can apply to all areas of your life. 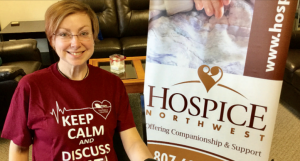 NOTE: The fee for the hospice volunteer training course is $100.00, which will be reimbursed to you after you complete the course and continue as a Hospice Northwest volunteer. The willingness to visit the client in various locations, such as home, hospital or long-term care facilities. Volunteers are asked which location they prefer when they begin volunteering. We will make an effort to respect your preference; however, volunteers are encouraged to continue with their clients even if the location of their client changes. Hospice Northwest volunteers are compassionate listeners with a caring attitude and the desire to give back to their community. If you feel you have those qualities, please give our Volunteer Coordinator, Thomas Bentz, a call at (807)626-5570, ext. 5580 to find out more information about volunteering. You can also apply by filling the “Click to Volunteer” application form below.